The ancient word Yoga means to yoke or bind, or more literally the union of the body and the mind. Horseback riding is very much like yoga as it involves a union between horse and rider, proper breathing, and a variety of positions that bring physical strength and stamina, not to mention awareness, to our riding. As we ride our goal is to create balance and to be present in the moment with the horse. In my mind, nothing forces you to be more present in the moment than riding a horse. It is nearly impossible to be thinking about work, shopping or cooking dinner while you are trying to navigate a 1,000-pound animal around a ring, down a steep path or over a three- foot jump. Riding involves channeling the horse’s energy and using your consciousness to communicate with him. You want the horse to direct his energy into a positive outcome, like flexing and bending or collecting and extending or even jumping! You want the rider to be communicating with the horse. When the flow of energy between horse and rider is at its best, you have balance. When you have a perfect ride, you know it because you know exactly what it is suppose to feel like. We’ve all had them and they all dwell in our subconscious memory. At some point in a rider’s career, they have ridden a well-trained horse. Nothing is more enjoyable than effortless communication with a well-trained horse. Many a show horse, such as a Thoroughbred jumper I used to lease, can no longer handle the demands of higher jumping divisions and has to take a step down to a lower level of riding. It happens to all horses as they age, they wind down their athletic abilities and with it comes the lower fences and eventually just flat work. These equine teachers are called “schoolmasters” and they are worth their weight in gold. A pleasure to ride, they teach novice riders what perfect riding feels like for the first time. They give veteran riders a perfect ride, when they have forgotten what it’s like from riding horses of different schooling levels. As riders our peak ability is determined by the horses we ride. I spent most of the year flat riding a young horse. I hadn’t been on a schoolmaster in about a year. Every rider benefits from taking a step back once and a while. Whether you are training young horses or just pleasure riding, it’s important to get on that schoolmaster that knows everything and can remind you where you need to be. Jumping a schoolmaster can really remind you of where your proper position should be and where it is in reality. 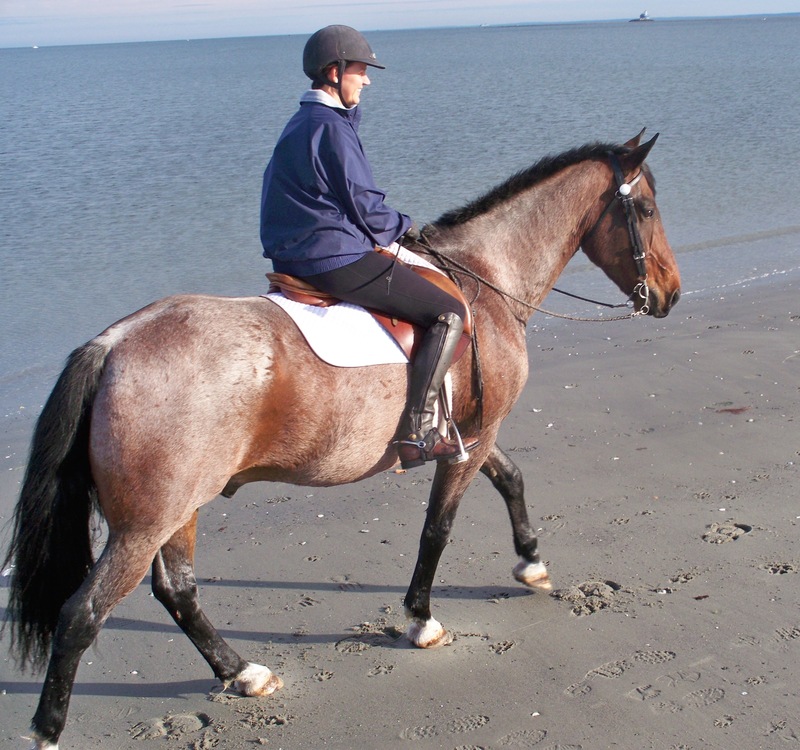 For me, that schoolmaster ride came last Sunday, on my former lease horse, a bay Thoroughbred named Mikey. Visiting Fox Hill Farms again and seeing Barb and Jane and all the horses was so much fun. It was pleasant outside, about 45 degrees and no wind, so we opted to have our jumping lesson outside. At the posting trot I was instantly reminded about his ‘big bouncy trot’ and how I have to post lower to the saddle to keep my position and really use those calf and core muscles I’ve been ignoring lately. During walking breaks, I would ask him to do a laterally movement here, an outside bend there, just to keep him listening and active to my leg. Mikey reminded me to sit tall with my shoulders back, keeping that straight line from my shoulders through my hip to my ankle. To me working at the walk is like yoga. You are putting yourself into the correct positions and holding them, building physical strength. As I held those correct positions, Mikey the schoolmaster obliged with supple movements and easy transitions. In riding, just like in yoga, we should practice awareness over action. For example, a horse trots too fast, we post faster to keep up with him — that’s action. An external force upon us that we are reacting to. If we practiced awareness instead, then when a horse trots too fast, we would be aware – internally – that we need to slow the pace, and we would post slower and lower. Our schoolmaster is well-trained and knows this cue and would come back to the pace that is ideal. He has taught us, reminded us, how to have awareness on horseback. We can also be caught up in doing rather than being. Jumping horses can be a lot of doing rather than being. Mikey excels at teaching me to be in the moment around the course. He teaches me to breathe, to relax, to clear my mind before we begin. As a schoolmaster he reminds me to set my pace, maintain it and leave it alone. Being not doing. To make proper turns and keep straight lines when jumping, Mikey teaches me to keep the proper position with eyes up, sitting lightly, hands soft and following. Being ready for the next jump, not doing the next jump. Just being Mikey brought me back into awareness, into that perfect position and gave me a much-needed perfect ride. Afterwards I gave this old schoolmaster two big carrots as a thank you! 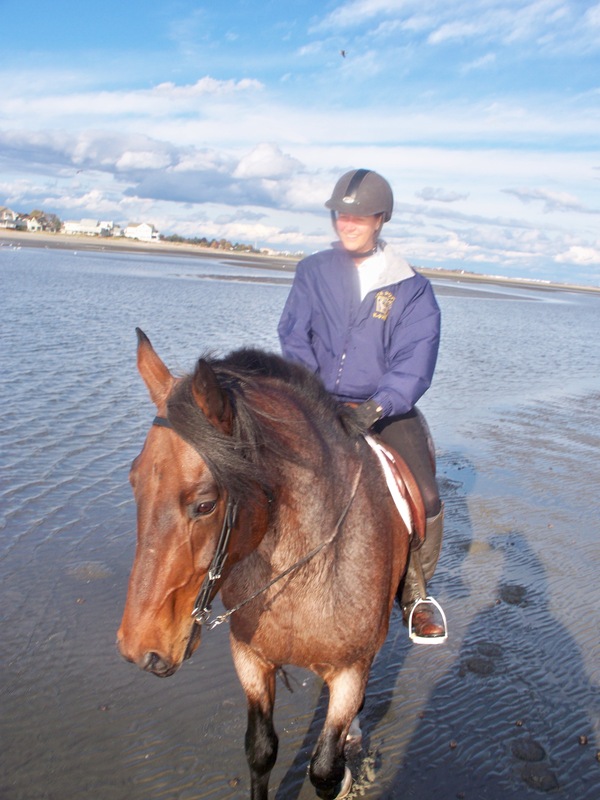 It’s beach season for Connecticut horse and dog lovers! 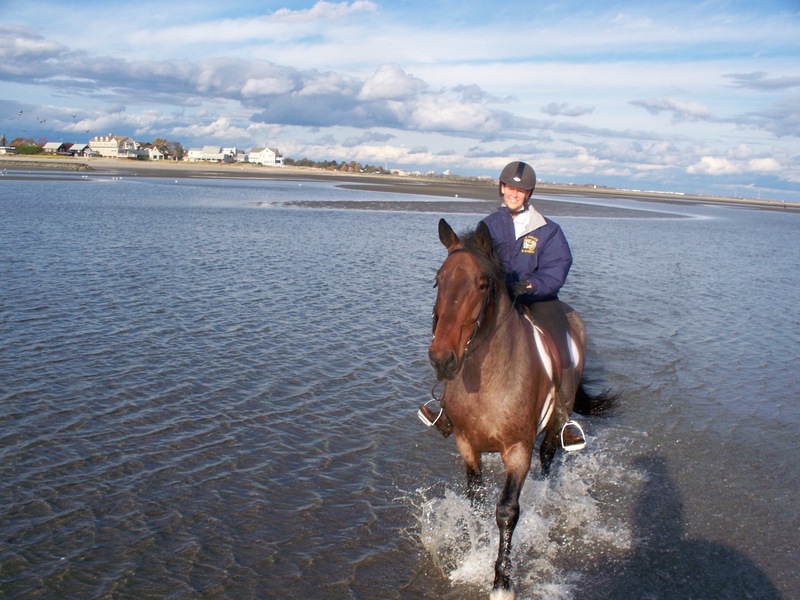 From October 1st to March 31st, horses and dogs are allowed on many local beaches to splash in the surf and kick up some sand. 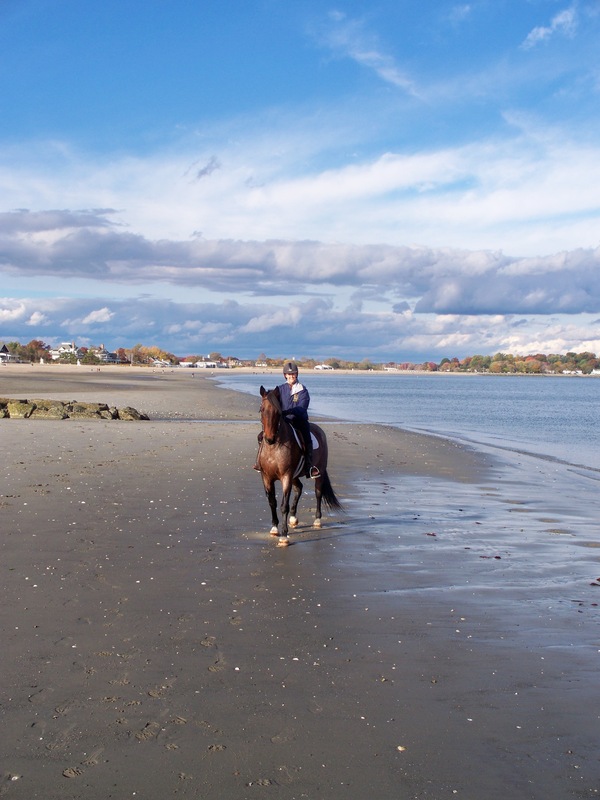 Fairfield’s Jennings Beach offers a superb swath of sandbars that during a super low tide give equestrians some awesome gallops. 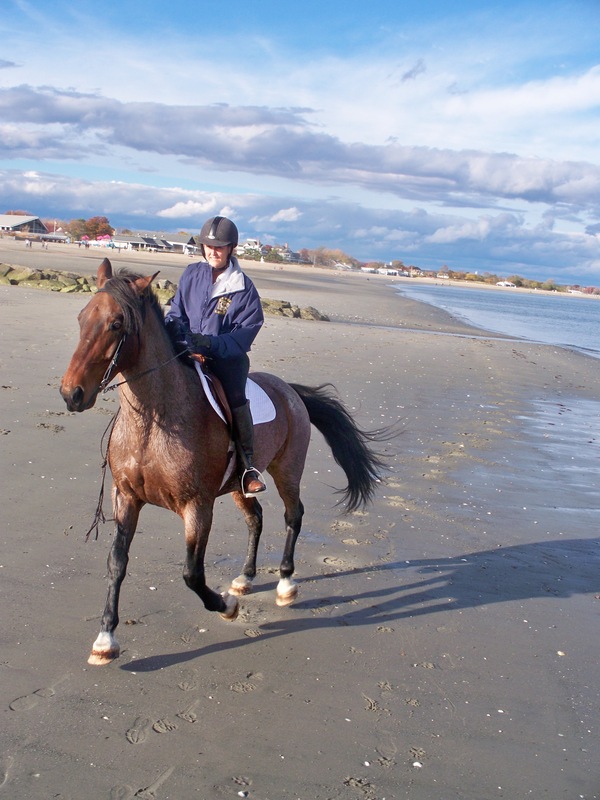 Recently, as I traveled to ride at Jennings, I thought back on my first two beach riding adventures, both on America’s West Coast. It all began at Pebble Beach when I was 12-years-old. My mother and I took one of those ‘nose-to-tail’ trail rides from the PB Equestrian Center nestled on the Monterey, California coast. We had to cross the 17-Mile Drive, with its stunning views of ragged coastline, wind-blown cypress trees and meandering sandy paths, to access the beach. Our horses, wearing large Western saddles with horns you could cling on to for dear life, were placid and practiced. No riding skills required here. Walking promoted sightseeing and discovery. The horses’ hooves dusted aside white sand and crushed coastal grasses as we made our way towards the ocean. As we walked along the edge of the manicured golf course, there where green links on my left and the deep blue northern Pacific on my right. 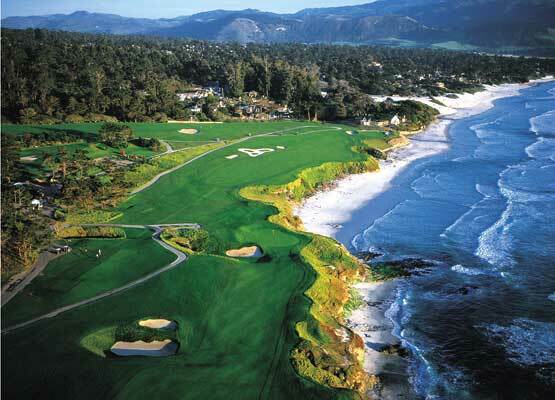 To this day, every time I watch the Pebble Beach Classic golf tournament on TV and they switch to the blimp view that pans the course from above, I am instantly brought back to that moment of wonder, when a horse connected me between the land and the sea in a seamless blue-green ribbon. 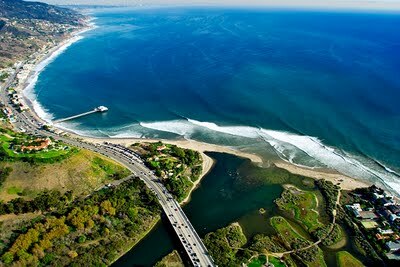 My next Pacific Coast adventure unfolded during college. One day while at Pepperdine University’s Malibu campus, and missing my horse back home, I noticed a 3×5-inch index card on the student community bulletin board. Scribbled in blue ink was an invitation to go riding on the beach. This 19-year-old was game. As we walked down a dirt path carved into the bottom of a clay canyon surrounded by shore pines, the aqua waves of Santa Monica Bay came into view and expanded as we reached the coast. We took a right turn, trotted some, and then from behind I heard the horses’ owner say, “Let’s Gallop!” And off we went. Up into my half-seat, my long hair flying behind me almost touching my chestnut-colored chaps which matched my horse’s coat. 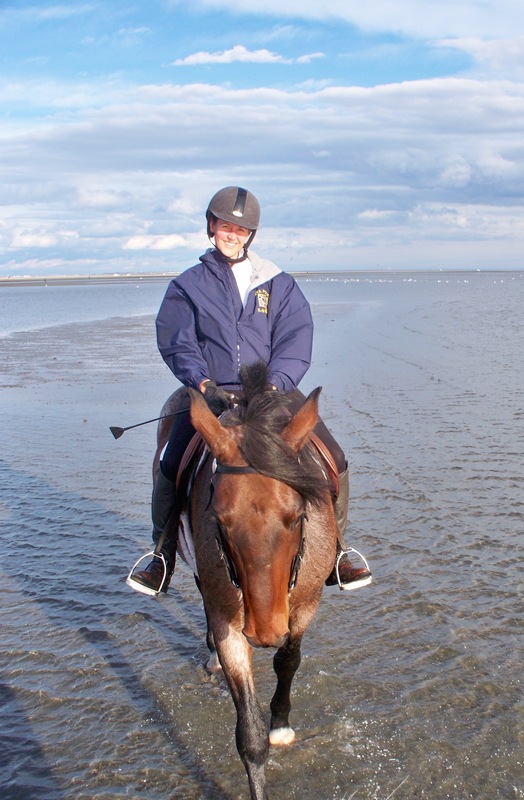 We galloped North up the beach and into the surf on the hard-packed wet sand. The best footing I’d ever felt. The horse loved it as he grabbed the ground with each lengthening stride. We spent several more hours of exploration among the scrubby brush and sandy cliffs of Malibu that day. Fast forward several decades. 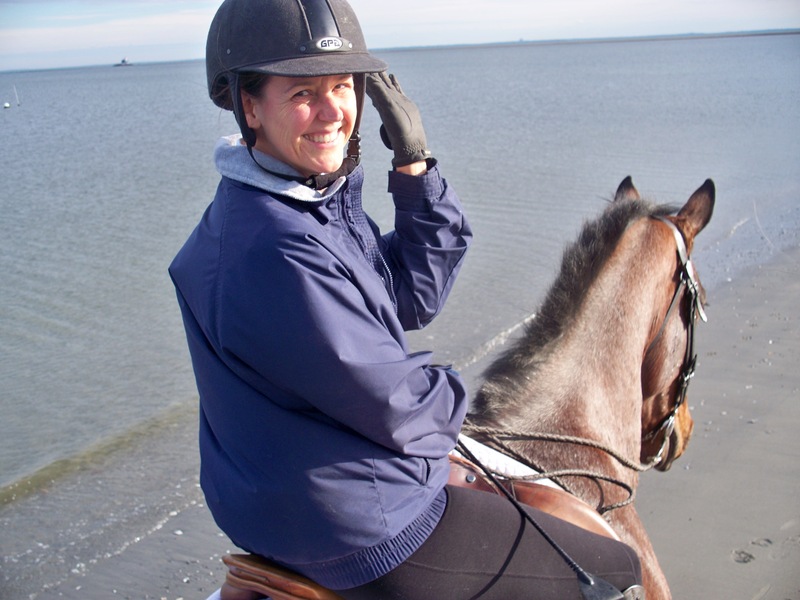 Last month, the beach riding experience came alive for me on the East Coast as I used the park’s picnic table as a mounting block, which is probably against the rules! It was a bright afternoon, unseasonably warm for the end of October. My horse and I headed straight for the surf. We took a right turn and trotted off. Oz & I off on a beach adventure! The bright sun coming down at an angle across the water glimmered so brightly I was missing my sunglasses. Each ripple on the water shone like a million strobe lights spread out across the sound. Then we came upon a flock of seagulls, but it was even bigger than a flock, whatever that might be called, a migration? Like little children spoiling a quiet gathering we raced at them. The gulls shot up towards the sky, and as we rode under them, they enveloped us in a squall, a snowfall of seagulls, swirling around us like a snow globe. While squawking in protest, gulls swooped past looking for a new landing place. Then we met up with some other horses. They left early and we meandered around the farthest jetty before heading home, to beat the incoming tide. At slack tide we moved into the barely bubbling surf. Then my riding partner yelled, “You ready? Let’s Boogey!” And off we went at a gallop. 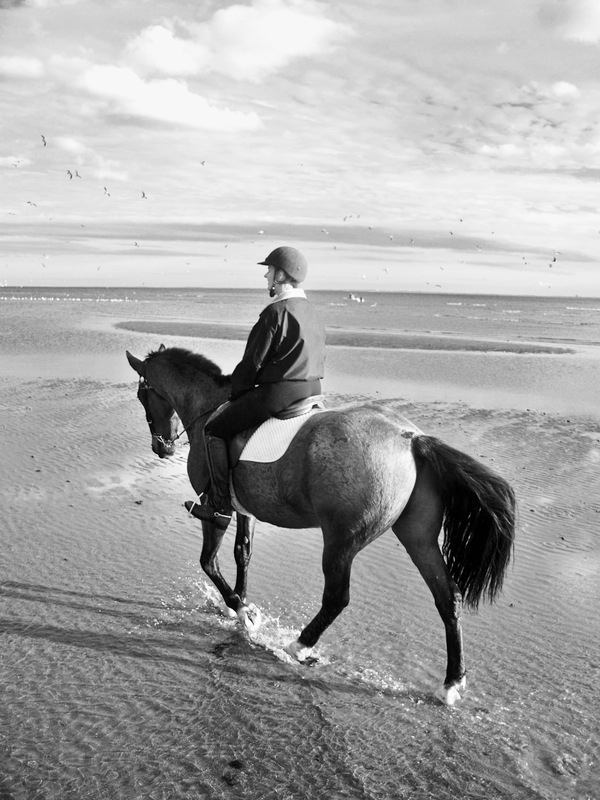 Up into my half-seat, smooth strides made rhythmic hoof falls on wet-packed sand. 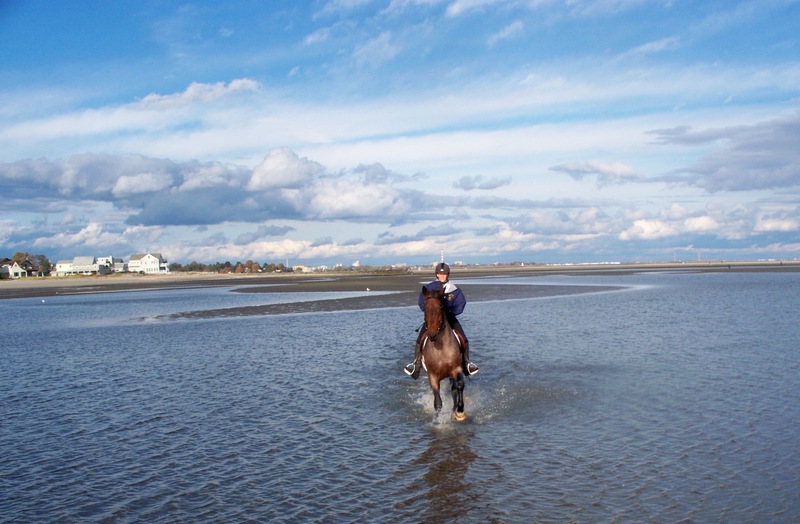 Cantering on the beach – best footing ever! Yes, I remember, best footing in the world for an awesome gallop! A huge smile spread across my face. The stone-colored sand on my left and the slate blue-grey water of Long Island Sound on my right. Once again, a horse had connected me to the land and the sea in a ribbon of happiness. The Pennsylvania National Horse Show just finished 10 days showcasing premier hunters and jumpers ridden by juniors and adults, all culminating in the $85,000 Grand Prix de Penn National. I watched nearly ever round of every class thanks to live streaming on the USEF Network (www.usefnetwork.com) the online channel of the United States Equestrian Federation (USEF). Thanks to technology horse-crazy girls like myself can experience equine sports to the extreme from the bending lines, in and outs, and long approaches of those exquisitely executed hunter courses to those thrilling triple combinations, rollbacks, and jumper jump-offs. To my delight I also watched Hunt Night, complete with a pack of hounds and the Ladies Side Saddle division, including jumping! Think about that for a moment. Premier horse shows, like dog shows, grew up in Manhattan’s gilded age in the 1870s and 1880s. The famous Westminster Kennel Club dog show, founded in 1877, which promotes itself as the second longest sporting event in America after the Kentucky Derby, was founded by a group of sportsmen. So too was the National Horse Show founded in 1883 by a group of sportsmen. And while horse sports, in the form of racing was established much earlier, with such venues as the Saratoga Race Course in 1863 during the Civil War, it was the post-war economic boom which fueled incredible wealth and the need to spend it on leisurely pursuits. At this point those gilded gentlemen and their ladies, needed some entertainment and bragging rights to amuse themselves during the rest of the year when they weren’t up at the “Saratoga Spa” but stuck in New York City for the fall and winter social seasons. Both Westminster and the National Horse Show chose the original Madison Square Garden at 23rd Street and Fifth Avenue as the venue for the premier events in their respective sports. As the popularity of equine sports soared after World War II the National had company. The Pennsylvania National Horse Show was founded in Harrisburg in 1945 followed by the Washington International Horse Show (WIHS) in 1958 in DC. These three top-rated urban horse shows held in large indoor arenas a few weeks apart in October were dubbed “the indoor circuit” or “fall indoors” for the last half century. I recall my first trip to the National as a young child mesmerized by something called the Puissance. This class basically asks a horse to gallop at a 7-foot brick wall made of wooden boxes and jump it. I also remember watching the Maclay Equitation Finals because a fellow rider at my barn was showing her sister’s beautiful black Thoroughbred mare Fleet Nancy, a relative of 1943 Triple Crown winner Count Fleet. I also remember another young girl who won that class, Leslie Burr, who hailed from Connecticut. It was at that show I fell in love with horse shows, jumping and Thoroughbreds! Last week I watched that same Leslie Burr, now Howard, pilot many jumpers around the Farm Complex at the Penn National via live stream. It was a different kind of thrilling than some 40 years earlier at the Garden, but still, today I could watch it where ever I was! And, Olympic veteran Howard keeps those beautiful horses right here in Newtown. This week I’ll be tuning in to watch the WIHS, which now bills its self as ‘the country’s leading metropolitan indoor horse show,” since the venerable National left Madison Square Garden in 1990s. Indeed, the WIHS has other bragging rights as well, including “The standing North American indoor Puissance (high jump) record of 7 feet 7 1/2 inches was set at Washington in 1983 by Anthony D’Ambrosio and Sweet N’ Low. And to finish up the indoor circuit October 28-November 2, the Alltech National Horse Show can be viewed online from USEF’s headquarters at the Kentucky Horse Park, the show’s home since 2011. It pleases me to know that the National, at one point near extinction once it left New York City, was a tradition founded and saved by a “group of sportsmen” and sportswomen too!